Enhanced pinning due to nanoscale strain is unique to the high-Tc cuprates, where pairing may be modified with lattice distortion. Therefore a comprehensive understanding of the defect landscape is required for a broad range of applications. However, determining the type and distribution of defects and their associated strain constitutes a critical task, and for this aim, real-space techniques for atomic resolution characterization are necessary. Here, we use scanning transmission electron microscopy (STEM) to study the atomic structure of individual defects of solution-derived YBa2Cu3O7 (YBCO) nanocomposites, where the inclusion of incoherent secondary phase nanoparticles within the YBCO matrix dramatically increases the density of Y1Ba2Cu4O8 (Y124) intergrowths, the commonest defect in YBCO thin films. 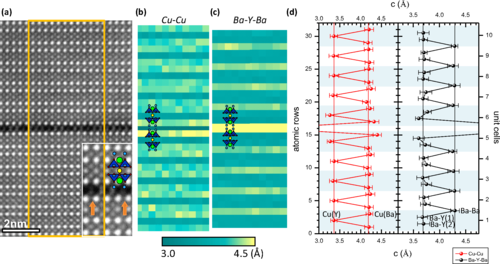 The formation of the Y124 is found to trigger a concatenation of strain-derived interactions with other defects and the concomitant nucleation of intrinsic defects, which weave a web of randomly distributed nanostrained regions that profoundly transform the vortex-pinning landscape of the YBCO nanocomposite thin films.